Continuing with our series of blog posts related to recipes to help our readers enjoy delicious food while following the Budwig protocol and diet, we want to provide you with some ideas for lunches. Remember that at lunchtime your digestive power is at its best! This is the time of day to make sure you get some raw food in your belly. Raw food is highly nutritious but often hard to digest. This is why we want to try and get some raw food in at lunchtime instead of the evening. For many in the western world, lunch is a bag of some processed food and a soft drink. This is very sad compared with the French and Spanish that stop work for at least 1 hour to enjoy a proper lunch. If you have only 30 minutes though, you can still enjoy a great lunch; it just takes a little preparation ahead of time. Serve over salad or use as a dip with veggie sticks. This can be eaten on whole grain, sourdough bread or with veggie sticks. Boil lentils in water while steaming the carrots and onions. Add garlic and the rest of the spices to the soup when the lentils are soft. Meanwhile cut and chop tomatoes, and red pepper. Add the fresh tomatoes and pepper to your dish at the end then add a drizzle of oil and extra salt if needed. Melt the coconut oil in a wok and add garlic until it browns. Remove from the pan and add spinach, salt, and paprika. Cover the wok and cook the spinach for 5 minutes. Add the chickpeas and water and stir until mixed properly. Wash the sweet potatoes and cut in 3 pieces. Wrap in vegetable cooking wrap and place in oven at 200º C for 15 minutes or until soft. Meanwhile, blend the quark, garlic and flaxseed oil in the hand blender. Add the salt and fresh herbs and serve as a sauce over the baked sweet potato. Join us on Facebook or Twitter. Looking for healthy recipes for my Mom who has cancer. SHe is 71 years old. I thought the only oil allowed on the budwig diet was flax oil? I noticed some of your recipes have olive or coconut oil. I love this mixture! I have been spreading it on an organic sprouted grain tortilla and making a veggie wrap with all the lovely veggies … or just adding sprouts and avocado into the whipped mix with salt and pepper … I put it in my garbanzo bean/spinach soup bowl and tonight I just had a baked potato and some steamed broccoli with CC&FSO + turmeric on them both as a dressing! This is good stuff. I just needed to make sure adding it to other dishes and other foods to it wasn’t compromising it’s efficacy. Thank you for your recipe ideas, that sounds delicious AND healthy! Dear Teresa, cold pressed olive oil that is added to a dish and not heated would be very good. Coconut oil is the one used to cook as the other oils should not be heated. 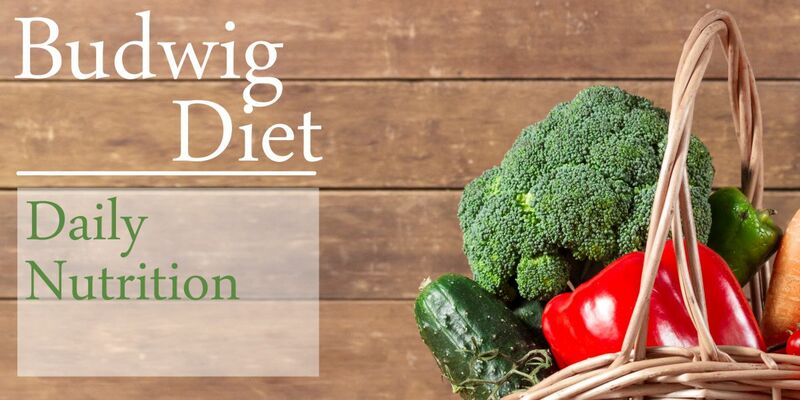 Any cold pressed vegetable oil can be used in the Budwig diet but only the flaxseed oil would be used in the muesli. I’ve downloaded the free guide, but still haven’t received this. Dear Nicola, sorry it hasn’t reached you. I’ve email it to you now. Dear Kathleen, I’m sorry these systems sometimes are not so easy. It could be our emails are going to your spam folder. You need to confirm your email by clicking on the link. Sometimes though the computer has security features that don’t allow it. I have emailed you our free e-book just now to the email you have used to comment in our blog. You should see an email from: admin@budwigcenter.com I hope you are able to receive it this time. How do I receive the free Budwig Guide? If you sign up here: https://goo.gl/EVhQRQ you then receive an email to confirm your email address works. You click on Confirm and then you have automatically signed up to receive the Free Guide in e-book format. That is sent in the next email, with a link. Check your spam in case you don’t see it the first time. I have singed up for the Budwig pack and diet but I have not received it. Good day! How shoud we make sauerkraut to drink juice from it in the morning? Hello and thank you for sending us this question. We actually buy the sauerkraut juice, we do not make it ourselves. Can you find it in a health food shop? Hello from America! What is vegetable cooking wrap as mentioned in the sweet potato recipe? Hi Ellen, it’s like thin paper and it’s usually white or brown. Enter your email address and we'll send you the Free Guide as well as occasional updates and tips regarding the Budwig Protocol. Thanks for subscribing!